Each tablet contains 34 mg praziquantel. Removes the most common canine tapeworms-Dipylidium caninum, Taenia pisiformis, Echinococcus granulosus and Echinococcus multiocularis. Safe to use for dogs more than 4 weeks of age. Safe to use for cats/kittens more than 6 weeks of age. DescriptionTroncil (Praziquantel) Canine Cestocide Tablets are sized for easy oral administration to either adult dogs or puppies. The tablets may be crumbled or mixed with the feed. IndicationsTroncil (Praziquantel) Canine Cestocide Tablets are indicated for the removal of the following canine cestodes: Dipylidium caninum, Taenia pisiformis, Echinococcus granulosus and for the removal and control of Echinococcus multiocularis. ContraindicationsThere are no known contraindications to the use of praziquantel in dogs. DirectionsTroncil (Praziquantel) Canine Cestocide Tablets may be administered directly per os or crumbled and mixed with the feed. The recommended dosage of praziquantel varies according to body weight. Smaller animals require a relatively larger dosage because of their higher metabolic rate. The optimum dose for each individual animal will be achieved by utilizing the following dosage schedule. FastingThe recommended dosage of praziquantel is not affected by the presence or absence of food in the gastrointestinal tract, therefore, fasting is neither necessary nor recommended. TreatmentDogs infected with E. multiocularis should be treated to prevent exposure of humans to infective eggs and to reduce perpetuation of the parasite's life cycle. The dosage of Troncil tablets for removal of E. multiocularis is the same as that indicated for the removal of the other tapeworm species listed on the label. Laboratory efficacy studies have demonstrated the recommended dosage is 100% efficacious for removal of this tapeworm. RetreatmentFor those animals living where reinfections are likely to occur, clients should be instructed in the steps to optimize prevention, otherwise, retreatment may be necessary. This is true in cases of Dipylidium caninum where reinfection is almost certain to occur if fleas are not removed from the animal and its environment. In addition, for treatment of Echinococcus multiocularis, a program of regular treatment every 21 to 26 days may be indicated. 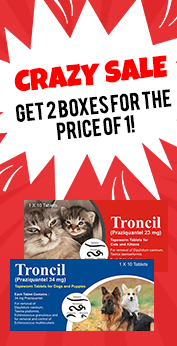 DescriptionTroncil (Praziquantel) Feline Cestocide Tablets are sized for easy oral administration to either adult cats or kittens. The tablets may be crumbled or mixed with the feed. ContraindicationsThere are no known contraindications to the use of praziquantel in cats and dogs. DirectionsTroncil (Praziquantel) Feline Cestocide Tablets may be administered directly per os or crumbled and mixed with the feed. The recommended dosage of praziquantel varies according to body weight. Smaller animals require a relatively larger dosage because of their higher metabolic rate. The optimum dose for each individual animal will be achieved by utilizing the following dosage schedule. RetreatmentFor those animals maintained on premises where reinfections are likely to occur, clients should be instructed in the steps to prevent reinfection; otherwise, retreatment may be necessary. This is true in cases of Dipylidium caninum where reinfection is almost certain to occur if fleas are not removed from the animal and its environment. 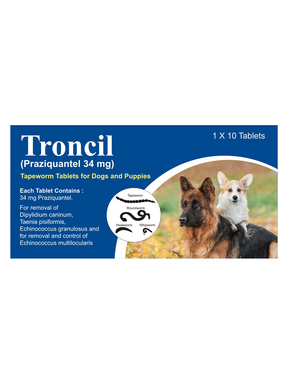 PregnancyTroncil (Praziquantel) has been tested in breeding and pregnant cats and dogs. No adverse effects were noted. Storage: Store at less than or equal to 77°F (25°C).